If you are like me, colder weather calls for comforting desserts, so I thought it was time to sample some of Hendricks County&apos;s best fall desserts. As a visitor to Hendricks County, I look to recommendations from local experts (that&apos;s you!) for some must-try fall desserts. Locals always have the best tips and recommendations on where to go! So, the Hendricks County CVB posted a question on its Facebook page, and there were lots of suggestions on the top Hendricks County fall desserts, which you can see by clicking here. I couldn&apos;t make it to every place, but here&apos;s what I tried. Harvest Moon Pie. I could not stop eating this slice of homemade pie, filled with fresh apples, cranberries, apricots and spices (maybe cinnamon) and of course it has a homemade pie crust. Every bite has just the right combination of fruit to pie crust. I enjoyed this so much that I saved some for a late night treat. Pumpkin Roll. This homemade roll looks like a cinnamon roll except it&apos;s made with pumpkin and spices and has an unbelievably addictive cream cheese frosting. The Pumpkin Roll is huge and can be enjoyed for dessert or breakfast with a nice mug of flavored coffee. Get there: Bread Basket, 46 S. Tennessee St., Danville, Ind., (317) 718-4800. 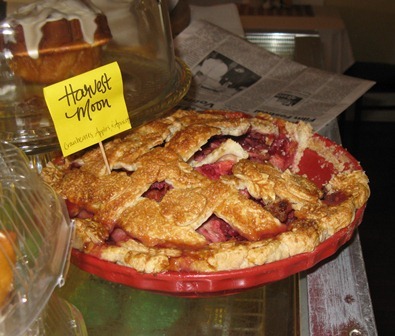 Serves breakfast and lunch Tuesdays through Saturdays with a side of friendly service and an assortment of baked goods. Tip: Plan ahead and order from Bread Basket for your upcoming holiday meals. 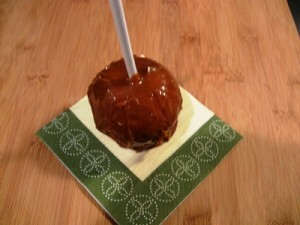 Caramel Apple (available with or without nuts). I&apos;m a fan of the tried-and-true caramel apple, which is dipped in hot caramel and best made with a top rate apple, like one at Beasley&apos;s. This is one of the best caramel apples I&apos;ve tried and will be popular with kids and caramel fans out there (like me). Cider Slushie. When I was a kid, I always had to get a Cider Slushie whenever my parents took us to the apple orchard. I love apple cider- so naturally, this icy treat is addictive. Apple Dumpling (made by St. Augustine church). Bites of this warm apple dessert (an apple baked in puff pastry and served with an apple glaze) filled and warmed me up as I walked around Beasley&apos;s. There&apos;s plenty to share, and you can opt to have a scoop of ice cream on top of your warmed up apple dumpling. 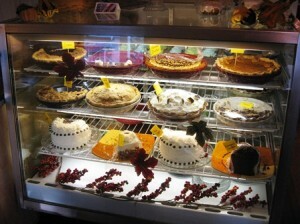 Get there: Beasley&apos;s Apple Orchard, 2304 E. Main St., Danville, (317) 745-4876. There&apos;s fun for the entire family- including hayrides, pumpkin picking, food, games, music and more. Tip: Stock up on apples, cider and other goods (caramel apples, cookies) at Beasley&apos;s store. As I mentioned, I couldn&apos;t make it to all of your Hendricks County fall desserts recommendations -- but here&apos;s some more of your top favorite desserts that I want to try at places I hope to stop at sometime soon! Let me know if I&apos;ve missed anything, and I&apos;ll add it to my list. Homemade Chocolate Pretzels at Confection Delights in Danville. One of the cupcakes at Sweetheart Cupcakes in Plainfield. Grandma Pete&apos;s Fruitcake at Court House Grounds in Danville. Pumpkin Pie frozen yogurt at Orange Leaf in Avon. Pumpkin Martini at Claddagh Irish Pub in Plainfield.